It's Final Fantasy week! 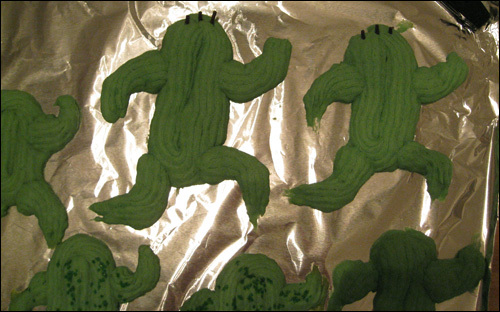 Found in just about every Final Fantasy game, the Cactuar inspires these running cactus cookies. 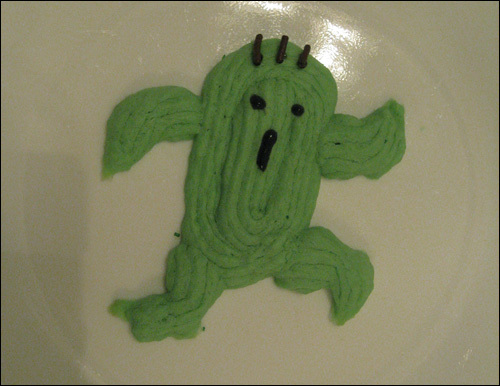 The name Cactuar is the western localization of the original Japanese Sabotender, a portmanteau of "Saboten Pretender", "saboten" meaning "cactus" in Japanese. Your geek trivia for the day! One of those pointy thingies that go on the end. 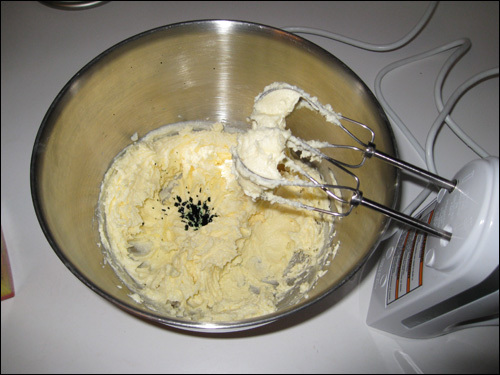 Liquidate the butter and mix with the sugar. Mix in the eggs and vanilla. 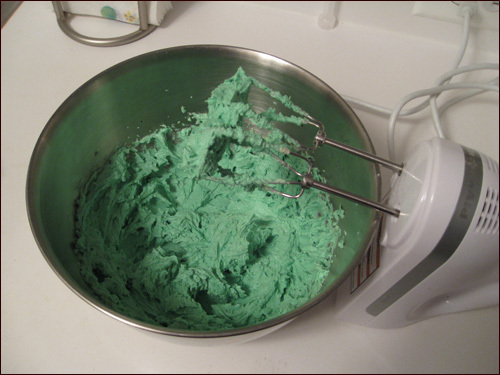 Add roughly 30 drops of green food coloring. Seems like a lot, but you'll need it. Add the dry ingredients. Mix! You don't want the dough to be too thick, which is why we melted the butter in the beginning. The viscosity should be low for the cookie dough to flow out the pastry bag with ease. Grab the pointy end thingie and twist it onto the pastry bag. Spoon dough into pastry bag. Squeeze hard and mentally prepare to form Cactrot shapes. Make sure you twist the top of the pastry bag to close it off before squeezing, otherwise dough blasts out the wrong end when pressure is applied. 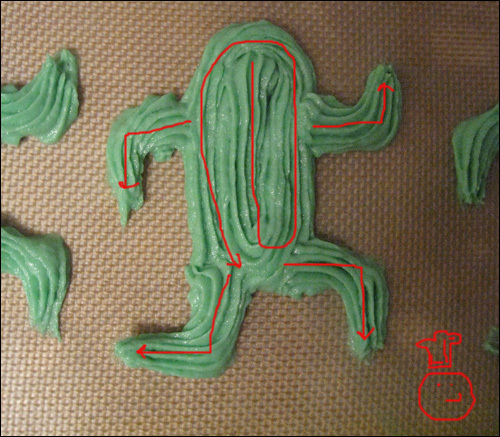 Not all Cactrots will be the same; the dough sticks to the nozzle at times and makes razor-edge precision difficult. For the legs and arms, you'll want to start them on the body to get a good connection. Otherwise, the joint between the arm / leg and the body will be too thin, causing the appendages to fall off during the transfer from cookie sheet to plate. Bake for about eight minutes. 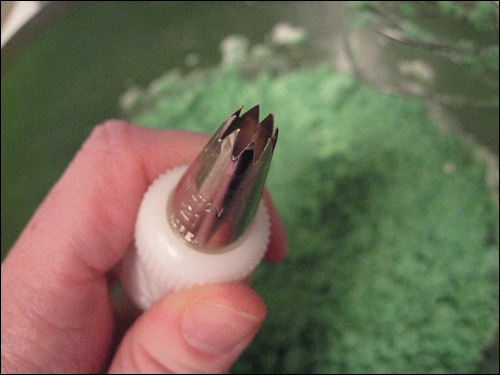 For the quills, you can either poke three chocolate sprinkles into the cookie top before the cookie cools, or wait until later and apply with a little black gel. 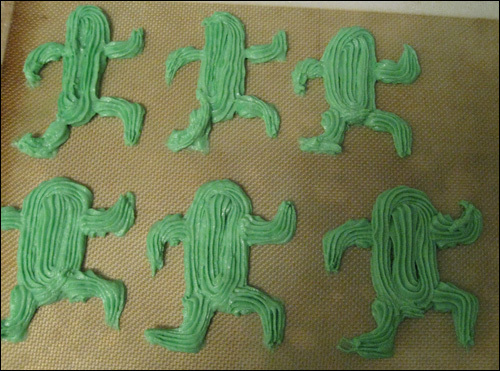 You can see some cookies with green sprinkles. Only a couple cookies have the sprinkles; they didn't really add to the Cactrot look so I didn't include them in other cookies. To finish, use the black gel to make two dots for the eyes and a line for the mouth. Makes about two dozen Cactrots. This page contains a single entry from the blog posted on January 28, 2008 12:45 PM. The previous post in this blog was Burgertime Cookie Burgers. The next post in this blog is Moogle Cupcakes.